Toronto Parks, Forestry and Recreation taking a hard line towards flower pickers? Yes, I know...I've been neglecting you, gentle reader, as it's been a month since my last post. Weeding, transplanting, and pruning almost daily (when it hasn't been raining) for my clients makes the time fly by. Finally, we're experiencing sunny and warm weather in late May and early June. This is truly one of my favourite times of the year to be outside. We know that the humidex readings of over 35 will be arriving soon so let's savour days like today. Speaking of today, I had no reason not to take pictures and write this post since the flowers are blooming so vividly around the corner. Paul Kane House has what I believe is the only English perennial border (or a reasonable facsimile) downtown. "Purple Sensation" alliums give vertical interest. I've seen them used with great effect planted in and among "Sum and Substance" hosta. 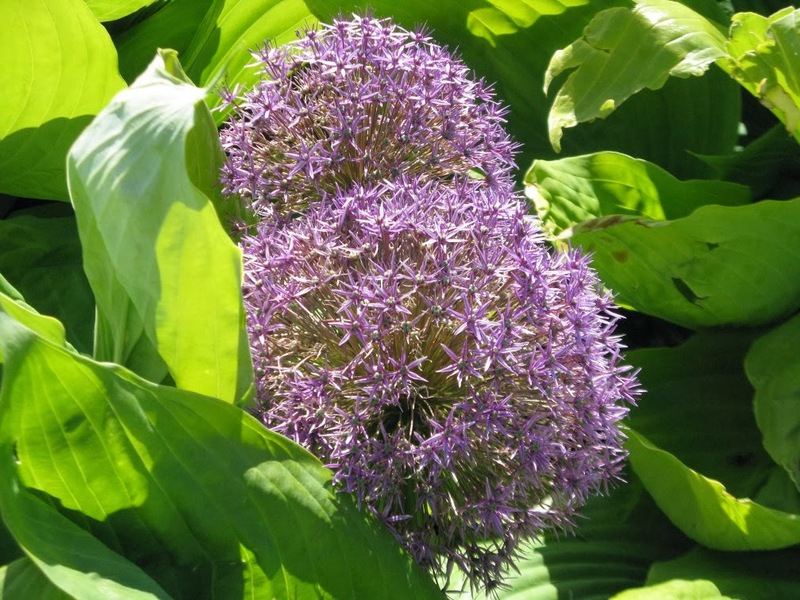 The hostas' chartreuse leaf colour and broad shape contrasts very well with the alliums' vertical nature and fine mauve inflorescences. In this bed, they contrasted nicely with the hot yet fragile-looking poppy flowers. 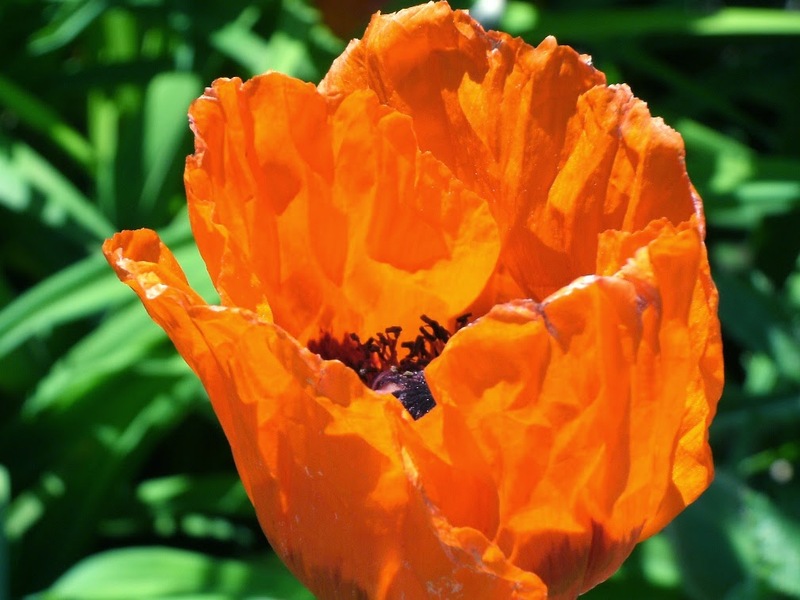 A closeup of an Oriental poppy flower and hairy buds (This may be the cultivar "Allegro.") 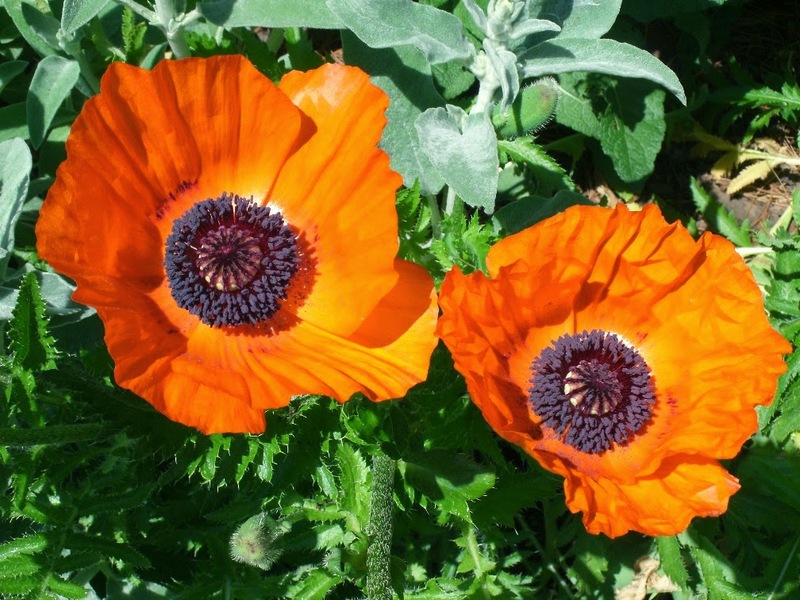 Yes, I can hear the whining about perennial poppies going dormant after a two week show but really, how can you not love the red-orange crepe-like petals and that dark hypnotic eyeball of a centre? And those buds! Since we're all consenting adults, am I the only one who sees them as, ummm, testicular and labial simultaneously? Yeah, maybe it's just me. I'm not a fan of bearded irises and prefer Siberian ones instead but I'll admit, these big blooms are eye-catching. The flower shape just doesn't do anything for me but I appreciate the purple and yellow contrast. A herbaceous peony bud is about to open to the left, sans ant/s. We are in downtown Toronto and the perceived threat of plant injury, theft, and overall mayhem is so high that the city's bureaucrats/garden cops have expensed this lovely partition to keep out ne'er-do-wells. It's all good and well to lean over and look but forget about actually smelling or touching a flower or leaf. If you cross your eyes and think positive thoughts, you might even make the barrier go away! Well, maybe not. with the parcel of land behind "condo ready!" I'm not out to be overly critical because I realize that these plants are nicer than the typical euonymous and Emerald cedar combos inflicted upon us and deserve to be protected in the urban environment. But this reality still doesn't make the fencing any less unattractive or minimizes the city's message: don't feed the plants! Hey, the flowers looks beautiful and eye catching. I think fencing is must as far as security is concerned. Isn't it? In this densely populated area, I think the fence is meant to keep out dogs relieving themselves among the poppies!